Some of you might have noticed that I sell some very useful and very sturdy front racks for bicycles. I get through quite a few, and yesterday realised that I'd sold the last one I had in stock. So, today I went to fetch some more from a bicycle factory in Hoogeveen, a town just about 40 km south from here. As ever, the ride was a pleasure. Just two traffic lights to stop for on the way there, and one traffic light plus giving way to some traffic twice on the way back. Here are some photos from the journey. For quickness, I take the direct route right down the side of the main road. However, that doesn't mean I have to ride on the main road. For about half the journey there is a cycle path. For the other half there is an access road as shown here, which is used by farmers vehicles and residents as well as cyclists such as myself and this child who is riding along on his own in the middle of no-where. Note the high level of subjective safety due to him not riding on the same road as the truck is travelling on. This dog always delights in chasing me the length of his plot every time I pass. This time I was ready for him and got a photo. It's not as dangerous (for me) as it might look. There is an "invisible fence" wire on the ground between me and him. And look, dogs really do lift all four legs when they run. Muybridge would be proud (or perhaps turning in his grave). A later stretch where there is a cycle path. Nice and smooth and wide, though in this case not quite so far from the traffic as most of it is due to having to pass the property with the flags. Note that the flags are all pointing in the wrong direction. Towards me. The headwind is my excuse for my tardiness today on the way to Hoogeveen. We're half way there in Beilen. This bus stop, like all of them, has plenty of cycle parking. On a work day it's full with commuter's bikes. It's called integrated transport. The one down side of it for cycling is that people who cycle only as part of their journey are not counted in figures for percentages of people who cycle for their journeys. In another post I show the amount of cycle parking at the railway station in Beilen. 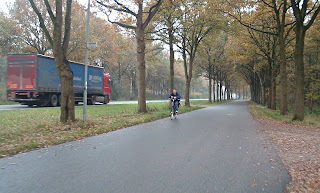 Cycle paths mostly have priority over side roads. Stopping and restarting on a bike is akin to making a detour of about 100 metres, so it would add up on a long journey. The priority really helps with getting where you're going in good time. The bike parked outside the factory. Actually, this is on a previous visit. I didn't think to take a photo today. I fitted in one extra rack today so in total rode with six of the handlebar mounted racks and five of the frame mounted racks. The bike is a Pashley PDQ recumbent (a touring recumbent, not particularly fast) and I tow a BOB Yak trailer for this journey. My bikes all have bicycle baskets, of course. Despite the greater than 35 kg weight of the racks, the return journey was quicker due to not having a headwind to deal with. I've noticed that some people like to write what they've been doing in the way of exercise. It's not really what this blog is about, but this is how far and how long etc. What I love about the United States: We can put a man on the moon, but we can't (won't) build anything as civilized as your cycling infrastructure. Thanks for that video; it's a real eye-opener. Not fit enough. I've gone further in 3 hours on an unencumbered bike, but that was enough only for 109th place. As I've mentioned before, I actually used to win the occasional race in the UK, but not here. Great Journey. I can see the advantages of a recumbenr: that's an impressive average with a headwind. The Cycleway on the junction looks narrower than elsewhere. How wide is it? Really, it's not that quick a bike. It's a relatively tall recumbent. It has perhaps a 10% advantage over my three speed, that's all. I used to own an upright which was consistently faster than this recumbent, and also another recumbent slightly lower which was faster again. However, even that is no match for a really fast modern design. I kept the Pashley as it's a very _comfortable_ touring machine, not for its speed. Do you mean the still photo with the silver car ? That junction is rather old looking, and a bit bumpy too, so ripe for resurfacing. The cycle path is a bit narrow. Probably not much more than 2 metres, I'd guess.